Learn more about the various types of omegas and how they can contribute to overall health. Many consumers have heard about the health benefits of omega-3 fatty acids, but most are unaware of the other omega fats that play various roles in improving overall health. Dietitians know there are several omegas found in foods and supplements, but it’s important to know exactly what they are, what role they play in the body, how they contribute to health, and what foods contain them so RDs can counsel patients more effectively. When talking about fatty acids, it helps to review or define common and often confusing terms. All fatty acids that bear the “omega” label are unsaturated, containing one or more double bonds. Omega fatty acids are classified according to the location of the first double bond by counting carbon atoms beginning with the last carbon. For example, the first double bond of an omega-3 fatty acid appears three carbons from the terminal end of the fatty acid chain. Likewise, the first double bonds of the omega-6, -7, and -9 fatty acids begin six, seven, and nine carbons from the end of their fatty acid chains, respectively. Unsaturated fatty acids are further classified as either monounsaturated fatty acids (MUFAs), because they have only one double bond (eg, omega-7 and -9 fats), or polyunsaturated fatty acids (PUFAs), because they have more than one double bond (eg, omega-3 and -6 fats). The nomenclature of each fatty acid uses the number of double bonds, the position of the first double bond, and the number of carbon atoms in the chain (see table below). For example, alpha-linolenic acid (ALA), an omega-3 fat, is identified as 18:3, n-3. The 18 refers to the number of carbon atoms; the 3 refers to three double bonds; and n-3 identifies the location of the first double bond on the carbon chain. EPA and DHA often are the focus of research, but the shorter-chain omega-3 fatty acid ALA also provides health benefits. “There’s a growing evidence base demonstrating a beneficial role of ALA in the primary and secondary prevention of cardiovascular disease,” says Jennifer Fleming, MS, RD, LDN, clinical project coordinator at Penn State University. “Based on the epidemiologic data, there are comparable CVD [cardiovascular disease] benefits for EPA + DHA vs. ALA. However, despite there being some clinical trial evidence about CVD benefits of ALA, there have been more studies conducted with EPA + DHA.” Other studies also support ALA’s potential benefits in chronic inflammation, the metabolic syndrome, inflammatory bowel disease, cancer, lupus, and rheumatoid arthritis, she adds. Linoleic acid (LA), an omega-6 fat, is the most common PUFA in the diet. The appropriate intake of LA and other omega-6 fatty acids is controversial. LA is the precursor to arachidonic acid (AA), which can be metabolized into bioactive eicosanoids associated with inflammation and chronic disease. Researchers have debated the merits of limiting omega-6 fatty acids in the diet to decrease the production of inflammatory compounds. There has been further concern that high LA intake will result in decreased production of omega-3 anti-inflammatory eicosanoids because of the competition of enzymes between the two classes of PUFAs. Nonetheless, the subject still is being debated. A reanalysis of the Sydney Diet Heart Study concluded that substituting LA for saturated fats increased death among men who had a recent coronary event.12 This study used safflower oil and safflower oil margarine in place of other fats, resulting in an LA intake of 15.4% of energy, which is greater than both recommended amounts and usual intakes. In addition, researchers didn’t measure trans fat intake. “Omega-6 fatty acids are not responsible for ill health,” says Kevin Fritsche, PhD, a professor of nutrition at the University of Missouri and coauthor of a systematic review on the topic published in the July 2012 issue of the Journal of the Academy of Nutrition and Dietetics. Increasing LA in the diet doesn’t significantly increase AA in the tissues; thus only a small portion of LA contributes to inflammatory eicosanoids, he explains. According to Fritsche, what many people don’t understand is that AA also is important for resolving inflammation. “Arachidonic acid is not just a bad guy; it also helps the body recover.” The same proinflammatory compounds trigger resolution and bring tissues back to health. Moreover, Fritsche says, omega-6 fatty acids are unlikely to block the formation of anti-inflammatory compounds from omega-3 fatty acids. Omega-3 and -6 fatty acids longer than 18 carbons bypass the rate-limiting enzyme. “Small amounts of AA and DPA [docosapentaenoic acid, an omega-3 fatty acid], which are found in meat and eggs, are taken up very efficiently by the cells.” Instead of being oxidized by the cells for energy, they’re converted to eicosanoids. Results of the systematic review should reassure nutrition professionals that both omega-3 and omega-6 fatty acids are beneficial, Fritsche says. Omega-9 fatty acids can be synthesized in vivo; therefore, they aren’t essential to the diet. However, dietary omega-9 fats affect cardiovascular risk factors. When they replace saturated fatty acids in the diet, LDL cholesterol levels improve, HDL cholesterol levels remain stable, and insulin resistance improves.13 When replacing carbohydrate in the diet, omega-9 fats increase HDL cholesterol levels and decrease triglyceride levels. Omega-9 fatty acids and diets rich in canola oil appear to lower dangerous belly fat, according to Peter J. Jones, PhD, a professor of nutrition and food science and the director of the Richardson Centre for Functional Foods and Nutraceuticals at the University of Manitoba in Canada. As demonstrated by the Canola Oil Multicentre Intervention Trial (COMIT), high intakes of oleic acid, but not PUFAs, cause increased production of a signaling molecule called oleoyleanolamide. “This turns up energy expenditure and suppresses food intake,” Jones says. Through oleoyleanolamide and improved body composition, omega-9 fatty acids may improve both cardiovascular risk and insulin resistance, he says. Because of the potential health benefits of omega-7 fats reported in the media, clients and patients may ask you about palmitoleic acid. It’s purported to reduce inflammation, increase satiety, promote weight loss, lower cholesterol and triglyceride levels, and improve insulin resistance. There are two forms of this fatty acid, explains Irena B. King, PhD, a professor in the division of epidemiology and the department of internal medicine at the University of New Mexico. The cis isomer is made in the body and consumed when we eat macadamia nuts, and the trans form is naturally present in meats and dairy, she explains. Unlike the metabolic effects of most trans fats, some research suggests that trans-palmitoleic acid has positive health effects, including improved insulin resistance and blood lipids.16 However, don’t jump on the omega-7 bandwagon just yet, King says, because more research must be done. “There are both positive and negative associations with omega-7 intakes. It’s not so clear-cut,” she says. 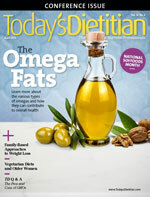 It’s common for clients and patients to ask which fats are the most healthful and which are the best cooking oils to use, says Bonnie Schmidt-Hayes, MS, RD, LD, CLS, a clinical lipid specialist at Case Western University Hospitals Harrington Heart and Vascular Institute Lipid Clinic in Cleveland. “I counsel on overall diet quality, with an emphasis placed on plant-based eating, including plant-based fats,” she says, adding that she advises patients to use olive and canola oils for most of their cooking. Long Island, New York-based nutritionist Karen Ansel, MS, RDN, coauthor of The Calendar Diet: A Month by Month Guide to Losing Weight While Living Your Life, also favors MUFA-rich olive and canola oils. She says canola has an additional advantage, as it also provides plant-based omega-3 fatty acids. Consistent with the AHA’s recommendations,17 both Schmidt-Hayes and Ansel suggest clients eat fatty fish such as salmon, tuna, mackerel, and lake trout twice per week to obtain EPA and DHA. For convenience, Ansel suggests buying tuna, salmon, and sardines in cans or pouches. “What could be easier than tossing them into a salad or pasta? It literally takes less than a minute,” Ansel says. Schmidt-Hayes recommends patients consume nuts and seeds a few times each week. And for clients who love butter, she suggests a trans fat–free margarine or a plant stanol/sterol–fortified margarine. Most recipes can be adjusted for fat quality, but some beg for solid fat, says Ellie Krieger, MS, RDN, a television personality and the author of Weeknight Wonders: Delicious, Healthy Dinners in 30 Minutes or Less. For classic cookies such as chocolate chip, she recommends using one-half butter and one-half canola oil. Her fix for cakes is to replace 1/2 cup butter with 1/3 cup canola oil, and if the cake is too dense, whipping the egg whites can increase the airiness. And for oven-fried chicken, Krieger sprays oil directly on the food. “It gives it a nice, even coating. You can use less oil, and it’s more uniform,” she explains. Yet each unsaturated fatty acid offers something unique, so dietitians can feel confident in recommending a variety of foods rich in unsaturated fats. — Jill Weisenberger, MS, RDN, CDE, is a freelance writer and a nutrition and diabetes consultant to the food industry, including Omega-9 Oils and Good Fats 101. She has a private practice in Newport News, Virginia, and is the author of Diabetes Weight Loss — Week by Week. — Source: Vannice G, Rasmussen H. Position of the Academy of Nutrition and Dietetics: dietary fatty acids for healthy adults. J Acad Nutr Diet. 2014;114(1):136-153. 1. Baum SJ, Kris-Etherton PM, Willett WC, et al. Fatty acids in cardiovascular health and disease: a comprehensive update. J Clin Lipidol. 2012:6(3):216-234. 2. US Department of Agriculture, US Department of Health and Human Services. Dietary Guidelines for Americans, 2010. 7th ed. Washington, DC: US Government Printing Office; 2010:24. 3. Kromhout D, de Goede J. Update on cardiometabolic health effects on ω-3 fatty acids. Curr Opin Lipidol. 2014:25(1):85-90. 4. O’Keefe JH Jr, Harris WS. From Inuit to implementation: omega-3 fatty acids come of age. Mayo Clin Proc. 2000:75(6):607-614. 5. Vannice G, Rasmussen H. Dietary fatty acids for healthy adults. J Acad Nutr Diet. 2014:114(1):136-153. 6. Dietary supplementation with n-3 polyunsaturated fatty acids and vitamin E after myocardial infarction: results of the GISSI-Prevenzione trial. Lancet. 1999:354(9177):447-455. 7. Mozaffarian D. Fish and n-3 fatty acids for the prevention of fatal coronary heart disease and sudden cardiac death. Am J Clin Nutr. 2008;87(6):1991S-1996S. 8. Swanson D, Block R, Mousa SA. Omega-3 fatty acids EPA and DHA: health benefits throughout life. Adv Nutr. 2012:3(1):1-7. 9. Judge MP, Harel O, Lammi-Keefe CJ. Maternal consumption of a docosahexaenoic acid-containing functional food during pregnancy: benefit for infant performance on problem-solving but not on recognition memory tasks at age 9 mo. Am J Clin Nutr. 2007;85(6):1572-1577. 10. Harris WS, Mozaffarian D, Rimm E, et al. Omega-6 fatty acides and risk for cardiovascular disease: a science advisory from the American Heart Association Nutrition Subcommittee of the Council on Nutrition, Physical Activity, and Metabolism; Council on Cardiovascular Nursing; and Council on Epidemiology and Prevention. Circulation. 2009;119(6):902-907. 11. UN Food and Agriculture Organization. Fats and Fatty Acids in Human Nutrition: Report of an Expert Consultation: 2010. Geneva, Switzerland: UN Food and Agriculture Organization; 2010. 12. Ramsden CE, Zamora D, Leelarthaepin B, et al. Use of dietary linoleic acid for secondary prevention of coronary heart disease and death: evaluation of recovered data from the Sydney Diet Heart Study and updated meta-analysis. BMJ. 2013;346:e8707. doi: 10.1136/bmj.e8707. 13. Gillingham LG, Harris-Janz S, Jones PJ. Dietary monounsaturated fatty acids are protective against metabolic syndrome and cardiovascular disease risk factors. Lipids. 2011;46(3):209-228. 14. Jakobsen MU, O’Reilly EJ, Heitmann BL, et al. Major types of dietary fat and risk of coronary heart disease: a pooled analysis of 11 cohort studies. Am J Clin Nutr. 2009;89(5):1425-1432. 15. Warensjo E, Sundstrom J, Vessby B, Cederholm T, Riserus U. Markers of dietary fat quality and fatty acid desaturation as predictors of total and cardiovascular mortality: a population based prospective study. Am J Clin Nutr. 2008;88(1):203-209. 16. Mozaffarian D, Cao H, King IB, et al. Trans-palmitoleic-acid, metabolic risk factors, and new-onset diabetes in US adults: a cohort study. Ann Intern Med. 2010;153(12):790-799. 17. Fish 101. American Heart Association website. http://www.heart.org/HEARTORG/GettingHealthy/NutritionCenter/Fish-101_UCM_305986_Article.jsp. March 20, 2013. Accessed January 26, 2014.